Did you know that Squarespace has a logo generator that offers free logos to anyone with a site? ($10 for none SQSP users). This and other cheap logo alternatives, like fiverr or logo contests like this one, has outraged lots of people in the design world. For the right people, this is an awesome tool and we think you should share it around. Better to use the SQSP generator (and copy their business card mock ups) than make it yourself. The built-in constraints will make it cleaner than what a non-designer would make on their own. Doesn't this undercut the value of Worstofall Design's work? Of course not! Here are 4 reasons why this platform is not only awesome, but should be saluted by everyone in the small business, design and branding world. Photoshop has made some things very simple for those who know how to use it. This means the design world has a low barrier to entry since anyone with Adobe Creative Suite can open up shop and call themselves a design, or even a branding, company. This logo generator makes clean design even more accessible to people who don't even know photoshop. But these tools ultimately weed out the designers who don't necessarily have value to add. It means that designers need to up their game to compete, and that should inspire higher and higher quality work. These programs push creatives to be creative again, and it's being fought because true creativity requires thought, and it's hard. Designers: don't fight it, embrace it like any real creative would and make something new. If you go on SQSP and pick a font and logo for your company, you will quickly see why those decisions require expert eyes. Once you see how difficult it is to make something new, it will make you appreciate the value and price tag for hiring professionals. Similarly, if one goes through that exercise and doesn't end up seeing that value, but rather thinks 'why would I pay thousands of dollars for a logo when I got this one for free?!' then this service if perfect for you. Since everyone starting a business needs a logo, but many don't have a budget for it, there is much time wasted with designers and start-up owners trying to agree on terms. In the end, nobody wins, time is wasted, and it's terribly inefficient. Better that those without a budget don't bother those trying to make a living, so that time spent applying, and negotiating terms for, a design project are closer to making a deal from the beginning. This will actually increase the value of design by better matching supply with demand and freeing up both parties with more time creating and less time being mis-matched. Why shouldn't people with no money be able to start a business? Take that starter logo and do your worst with it (and you know we mean that in the best possible way) work your tail off, sell and save, and when you're ready to take that company to higher places and have the budget to do it then you can invest. It's nearly impossible to open a business with a badass, differentiated brand unless you have big money to invest, so this makes it easier. All hail capitalism! In short, this is a great tool to promote starting businesses, and only helps to promote the value of expert design & branding. Squarespace does it again! Every font has a distinct personality that is influencing how we interpret the words they are expressing, whether you are aware of it or not. Our feelings about typefaces are dictated by factors such as our collective experience, history and culture. Font history geek out session here. If you're a lawyer charging $800/hour, would you show up to a business meeting in a ripped t-shirt? Likewise are you trying to sell graffiti covered skateboards dressed in a 3-piece suit? Getting the font wrong on your marketing materials, including your website, can be like walking into the meeting in the wrong outfit. Yes, you still showed up, but get the font terribly wrong and people will be subconsciously thinking something that contrasts what you are actually saying. Here's an unfortunate comic font used by a lawyer. Would you take him seriously? While you may prefer a thin, script typeface, if your a sporting goods company, it's probably not the best option for you. If you ignore the general perceptions of a font or design choice in favor of your own personal opinion and you get it wrong, it will hurt your business. As important as it is for you to love your brand, it is equally important to be aware of how your audience will identify with your expression. Therefore the general perceptions of a font's personality should dictate which font is used for your brand over your own personal taste. Below are some general font rules that can be applied to your business. These associations are not set in stone but are a good place to start. Thinner, more elegant fonts are associated with beauty or femininity and as a result are often applied to women's fashion & lifestyle brands. 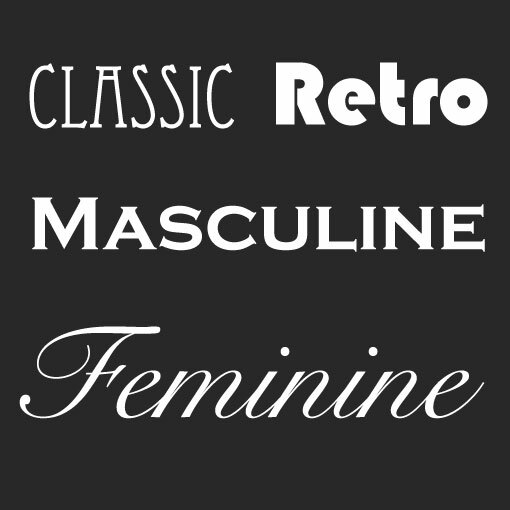 That's not to say that a thin font cannot be masculine, but it, too, would most likely be associated with men's fashion or lifestyle. In contrast to the thin elegant typefaces, heavier, thicker fonts can be more masculine as well, because of their sturdiness and less exclusive than thinner, more sophisticated fonts. Upper or lowercase characters are an added variable to font personality. An uppercase font is louder, more urgent and commanding than a lowercase font which in comparison seems friendly, understated and even childish or youthful. Another broad personality perception is the difference between serif and san-serif typefaces. Since serifed fonts were created and used long before san-serifed fonts they don't just feel more classic and traditional, they actually are. Modern typefaces like helvetica are in fact more contemporary than serif fonts like times new roman, and this association is unavoidable. Many times the history of a font is a better indicator as to what its public perception is rather than your individual opinion of it. The list of traits of different fonts and what feeling their distinguishing elements project can go on forever, which is why having an expert with knowledge of typography is imperative for applying fonts to businesses, products and brands. Why do we hire professional companies to perform tasks for us? Because they have expertise in a particular field and it would take too much of our valuable time to master those skills on our own. When you calculate the time you would spend trying to execute something you are not an expert in, and multiply it by how you value your time, you will often find the number to be much higher than the cost of hiring an expert. Someone who is an expert in their field has presumably spent a significant amount of time becoming an expert! Even if you did take the time to learn the trade, you are not going to be able to put in the years that an expert has spent focusing on the exact deliverable you need, and your results just won't be as good. In some industries you might be ok with this. Maybe you paint your apartment yourself and you make a few mistakes, but you've decided you can live with the imperfect edging where the ceiling meets the wall. But do you want to take that same liberty with the face of your company? If you have clarity on your brand's message and personality, there are not 10 equally amazing logo options for your brand. So a company that offers to show you that many options is basically saying they will throw sh*t at the wall and see what sticks. Or, to be more polite, they will create what you tell them to, making you the designer. A good designer will save you from yourself, because as much as you must love your company's logo and brand, it must also be effective for your business, and this requires a third party perspective. Your most important job during the process is to be open and honest about who you are, your goals, and your taste preferences. If you've found a design company whose expertise you trust, you should feel that you are in good hands and that they will show you only the best options. Let them curate the logos for you and you will end up with a better product. Quality over quantity gives you the time and confidence to focus on what you do best: running your business! Still nervous about only seeing only 3 concepts? See what that looks like here, here, and here! Check out some of our badass logos here.